Linking volunteer educators with international opportunities, affiliated with the Baptist World Alliance. I have just got back from Europe after some holiday that followed attendance at two Baptist World Alliance-sponsored conferences in Prague, the Czech Republic. One of these conferences was the Baptist International Conference on Theological Education (BICTE). It was attended by about 120 people, was the seventh of its kind and was held this year at the International Baptist Theological Seminary (IBTS). This was an excellent conference, superbly planned by David Crutchley (Co-chair, Academic and Theological education Workgroup, BWA) and his international team, with stimulating papers and wonderful networking opportunities. Gathered July 26-29 in Prague, Czech Republic, for the seventh Baptist International Conference on Theological Education (BICTE), Baptist educators, pastors, practitioners, theologians and emerging leaders from the worldwide Baptist family reflected on the theme "Probing the Theological Boundaries: The Baptist Story from Amsterdam to Tomorrow." The program began with a session tracing Baptist theological footprints over the past 400 years. Subsequent sessions explored topics relating to ministerial formation and heard reports from member regions about the status of theological education around the globe. Participants were particularly challenged to consider how their institutions could address the contemporary ecological crisis; the exploitation of women and children; the changing forms of worship in the church; greater utilization of art, film, and other media in the classroom; and a radical spirituality that is open to fresh winds of the Spirit. 1. Enact convictions and practices evident in the historic walk of early Baptists: reading the Bible, living the life, nurturing the community, redeeming the powers, and telling the story. 2. Welcome from our many cultures and contexts new insights in the form of diverse enactments of our common Baptist way of life. 3. Pursue theological education that involves a life-long process of learning for both students and teachers to be carried out in joint partnership with local churches. 4. Uphold the sacredness of all life, actively demonstrating our faith by respecting and caring for God's creation. 5. Seek repentance for our failure to advocate for those who are abused, impoverished, and marginalized. 6. Prepare leaders who will equip local communities to live the Christian life, share the gospel, and engage in works of justice as expressions of Christian love. 7. Glorify the Triune God through holistic practices of worship, work, and witness in which our Lord Jesus Christ summons us through the power of the Holy Spirit to join in God's mission to all the world. It might be a good idea to circulate this statement among your seminary students and staff and consider how directions in your training world are resonating with these. A more focused posting on Theologians Without Borders will follow. 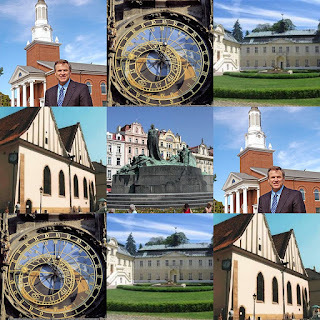 Conference Collage (David Crutchley, the clock in the centre of old Prague, IBTS buildings and grounds, the Bethlehem Chapel where Jan Hus served and the statue of the reformer Jan Hus which stands in the main square). After seven years in the United Arab Emirates I have returned to Ashburton, Melbourne, to live and work.